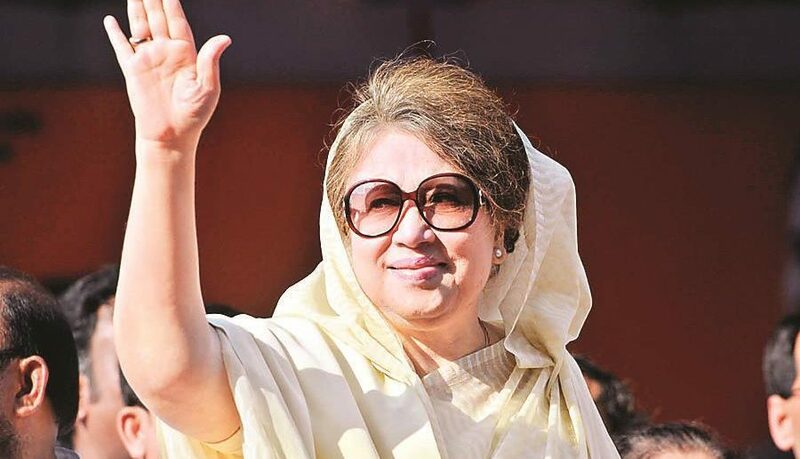 Nearly two months after she was sent to Old Dhaka Central Jail, BNP Chairperson Khaleda Zia came out of it for the first time on Saturday and underwent some medical tests at Bangabandhu Sheikh Mujib Medical University (BSMMU) for her reported illness, reports UNB. A black Pajero jeep carrying Khaleda left the central jail around 11:20am and reached the BSMMU 10 minutes later amid tight security. The 73-year-old BNP chief, clad in an off-white Jamdani sari with black print, got down the vehicle in front of BSMMU’s Cabin Block around 11:35am. She was offered a wheelchair to go to the Cabin Block on the 4th floor of the hospital but she refused. She then walked to the lift and went to room No 512 for check-up. A few minutes later, BSMMU director Abdullah-Al-Harun came down to the ground floor and called the names of four doctors–Dr Wahidur Rahman, Dr Mamun, Dr FM Siddique and Dr M Ali — through a loudspeaker requesting them to go to the 4th floor. They all but M Ali then went to the cabin number 512 where Khaleda was staying for her health check-up. Of them, Dr Mamun is the BNP chief’s personal physician. The doctors talked to Khaleda and examined her health condition. Later, she was taken to the BSMMU’s Radiology and Imaging department on the ground floor of a building opposite to the Cabin Block where x-ray on her knee and two hands were conducted. The BNP chief went there on foot as well. Just after completion of her tests, Khaleda’s late son Arafat Rahman Koko’s wife Sharmila Rahman Sithi along with her two daughters — Zafiya Rahman and Zahiya Rahman — met Khaleda for a while. They got the chance just to exchange greetings with her. Later, she walked to her vehicle to go back to the jail from the BSMMU. The jeep carrying Khaleda escorted by huge law enforcers left the BSMMU around 1.33pm and reached the jail around 1:46pm. Meanwhile, Khaleda’s two lawyers — SanaullahMiah and Barrister Mahbub Uddin Khokon — met Khaleda at the hospital. Police detained several BNP activists as they tried to stage demonstrations in front of the hospital. After the BNP chief’s departure, BSMMU director Abdullah-Al-Harun told reporters that her health condition apparently looks good. “We managed a wheelchair for her but she preferred walking from cabin to the Radiology and Imaging Department. Four doctors–Dr Wahidur Rahman, Dr Mamun, Dr FM Siddique and her personal physician of the jail– who were preferred by Khaleda Zia, were present during the whole process,” the director added. He said several x-rays of her bones were taken there, according to the suggestion of the medical board formed by the government earlier comprising four professors of Dhaka Medical College and Hospital (DMCH). “Hopefully, we’ll get all the test reports tomorrow, and those would be sent to jail authorities as soon as possible,” Harun said. However, BNP senior joint secretary general Ruhul Kabir Rizvi alleged that the government staged a drama by sending Khaleda to the BSMMU by force in the name of her medical tests. Earlier, BNP standing committee member Moudud Ahmed told reporters at the BSMMU that they do not have any confidence in the treatment for Khaleda arranged by the government. He demanded the government immediately release their party chairperson granting her bail so that she can receive proper treatment on her own arrangement. Khaleda Zia fell sick in the jail on March 29. BNP Secretary General Mirza Fakhrul Islam Alamgir on Friday met Khaleda in jail and said her physical condition was not that much good. He demanded the government immediately permit the BNP chief’s personal physicians to meet her in jail to examine her health and provide her with proper treatment. On April 1, the government formed a medical team with four professors of Dhaka Medical College Hospital to examine her health condition and ensure her treatment in the jail. On February 8 last, a special court here sentenced Khaleda to five years’ rigorous imprisonment in the Zia Orphanage Trust graft case. She was taken to the old central jail minutes after the verdict had been delivered.